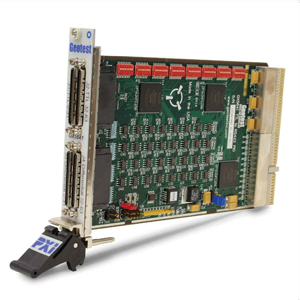 The GX5642 is a 3U PXI instrument card that can be used for general data acquisition, process control, Automatic Test Equipment (ATE), Functional Test, and factory automation applications. The GX5642 consists of 64 bi-directional TTL-to-differential LVDS I/O channels. Each channel has two ports (TTL and LVDS) and can be individually set to operate in either conversion or static I/O modes. The GX5642 can support 128 individual digital inputs or outputs, 64 TTL, and 64 differential LVDS, or 64 conversion channels. Each channel on the GX5642 can be individually programmed to operate in conversion or static modes. Conversion direction defaults can be set by configuring on board switches. Depending on the selected mode, the GX5642’s channels can be predefined to convert TTL to differential LVDS or vice versa. Each channel of the GX5642 can be individually set under software control to operate in one of two modes: conversion or static I/O. In static I/O mode the GX5642 supports 128 individual digital inputs or outputs: 64 TTL and 64 differential LVDS ports. The direction of each of these ports can be individually set under software control to be an output or input; e.g., Channel 1 differential LVDS port output and Channel 1 TTL port input. In conversion mode the GX5642 supports 64 individual channels, each of which can be programmed to convert TTL to differential LVDS or differential LVDS to TTL. Each channel’s predefined DIP-switch conversion direction can be loaded at any time, overriding current settings (predefined defaults). In both modes of operation, the TTL and differential LVDS signals can be monitored. On power-up, all 64 channel outputs are disabled. The GX5642 includes a 100-Ohm terminator for each differential I/O signal. The GX5642 can also be configured to operate as an independent module, without software control. When configured in independent mode, the module operates in the conversion mode only and the direction of each channel is set at power-up according to the default direction switch settings. The board is supplied with the GXPIO library, a software package that includes a virtual instrument panel, and a Windows 32/64-bit DLL driver library and documentation. The virtual panel can be used to interactively program and control the instrument from a window that displays the instrument’s current settings and status. In addition, interface files are provided to support access to programming tools and languages such as ATEasy, LabView, LabView/Real-Time, C/C++, Microsoft Visual Basic®, Delphi, and Pascal. An On-Line help file and PDF User's Guide provides documentation that includes instructions for installing, using and programming the board.